Bladder cancer is a common malignancy in Australian society. This section aims to answer some frequently asked questions that arise when bladder cancer is diagnosed or suspected. Lifestyle: Smoking is the single greatest risk factor for bladder cancer; smokers have twice the risk of developing bladder cancer than non-smokers. There is also some evidence that diets that include a large amount of fried meats and animal fats are associated with an increased risk of bladder cancer. Occupational exposure to industrial carcinogens: Chemicals that have been proven to increase the risk of developing cancer may also contribute, particularly exposure to aniline dyes. Workers in the rubber, leather, textile, hair colouring, paint and printing industries are at increased risk unless proper safety precautions are taken in the work place. Treatment for other cancers: Cyclophosphamide (Cytoxan) is a chemotherapeutic agent that increases the risk of bladder cancer. Patients receiving Cytoxan should be monitored with at least urinary cytology on a regular basis. Pelvic radiation therapy (eg. for prostate cancer) also carries an increased risk of developing bladder cancer over a 5 – 15 year period. Bladder cancers are staged by how far they have invaded into the bladder wall. 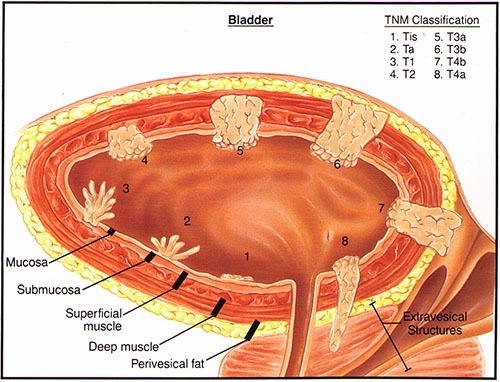 The bladder wall consists of three main layers: the mucosa (inner most layer), the submucosa, and the underlying muscular wall (outer most layer). Anatomy of the bladder and location of different bladder cancers. Cancers that are confined to the mucosal layers are termed non-muscle invasive or superficial bladder cancers. Invasive bladder cancers are those that penetrate into the muscular layer of the bladder wall and require more aggressive therapy.